“We need people like Bradley Manning,” said singer Graham Nash on Friday night at the Nourse Auditorium in San Francisco, in conversation about his new book, Wild Tales: A Rock & Roll Life. The evening ended with questions from the crowd, a convention that in lieu of any interesting questions coming from the stage often provides the most interesting parts of these so-called public discussions. “Do you think they really want protest songs on the airwaves? Do you think they want people singing about these things on TV?” answered Nash with more questions, while further noting the media has largely turned its back on free speech matters. Though he suggested our first and fifth amendment rights were our country’s greatest assets, his questions were perhaps an acknowledgement that we can no longer rely on a free press to help us protect those rights to speech, a fair trail, or to keep us truly free. 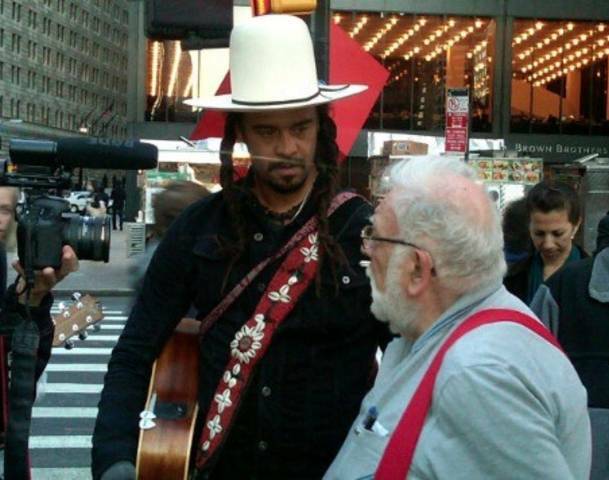 Advocating for truth-speaking and against torture, as well as for solar power and ending world hunger, Nash isn’t just a one-size-fits-all protest singer; rather, he’s one who’s consistently stood strong against nuclear power, supports the science behind climate change, and was on the side of the Occupiers on Wall Street. The musician of conscience has consistently weighed in with songs of resistance since the dawn of his career, as a solo artist, as a member of the duo, Crosby & Nash, and the supergroup, Crosby, Stills, Nash & Young. Last week I posted Nash and James Raymond’s song for Bradley Manning; his earlier works like “Chicago” and “Immigration Man,” among others, bear his mark of vocal excellence combined with pointed, topical concerns. On Friday, the crowd was comprised largely of freethinkers, baby-boomers, and progressives in accordance with Nash’s views, clued-in enough to ask: Had he ever requested his FBI files? Born in Blackpool, England but a citizen here since 1978 Nash answered with yet another question: “Why would I care if they have papers on me?” He shouldn’t. But rest assured, they do. 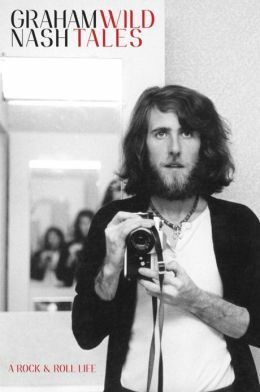 And had I held a mic that night, I would’ve first and foremost thanked Graham Nash—bold enough to sing the contents of his heart and mind for over 50 years—no questions asked. This piece is adapted from an column that appeared in Paste in late 2011. Alongside organizers, activists and orators, music people of all orientations have long brought the soul, sound, and heart to social and political movements. 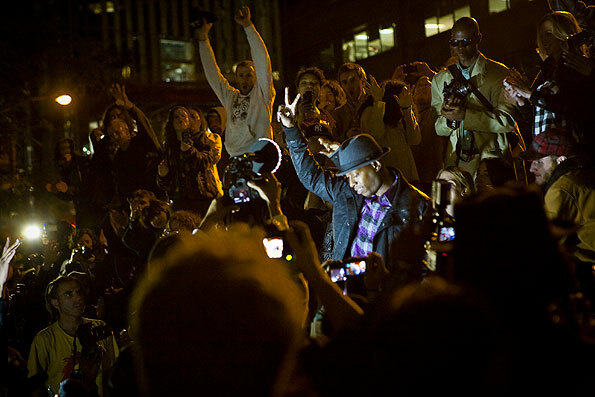 During 2011’s income disparity protests, the lionhearts of contemporary music turned out for the Occupation: Ever-ready artist/activist Michael Franti showed up to “Yell Fire.” Talib Kweli, longtime resident in the trenches of conscious hip hop, dropped some rhymes, weighing in with a powerful piece called “Distraction”: “Skip the religion and the politics and head straight for the compassion, everything else is a distraction,” he rapped. 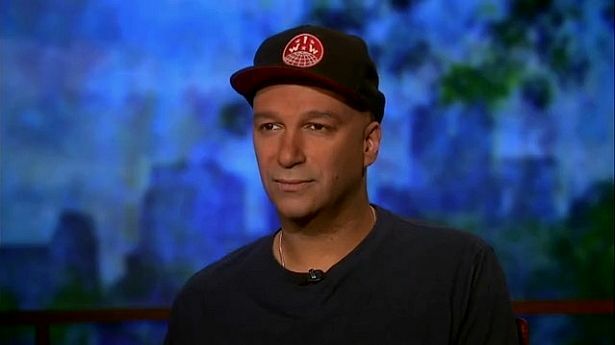 Tom Morello, who as The Nightwatchman, shows up with his ax wherever injustice is served, came out to lead a chorus of “This Land is Your Land,” the old Woody Guthrie song that’s easy enough to sing along to, even if you don’t know the words. And the generally apolitical Jeff Mangum of Neutral Milk Hotel delivered a rare, impromptu set of songs to the delight of Occupiers. In particular, the line “we know who are enemies are” from the fan favorite, “Oh Comely,” drew cheers from the crowd. Mangum’s appearance, if not his topically unspecific songs, provided the people with entertainment and support, the kind of unique companionship that only a song can provide in the cold, cold night. “Our idea was to go down and raise their spirits,” said David Crosby, who with Graham Nash sang for the Zuccotti Park crowd. “What music is doing is unifying the people, bringing them together,” Nash told Rolling Stone. Hip hop organizer and mogul Russell Simmons was among those on the street with the 99 percent; part of his role there was shepherding visitors like the Rev. 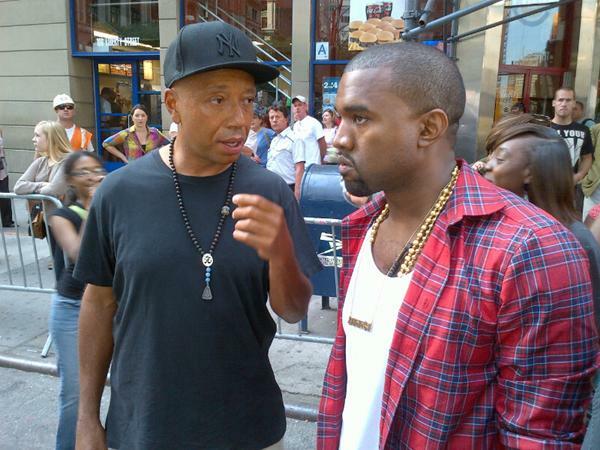 Al Sharpton and Kanye West through the New York encampment. 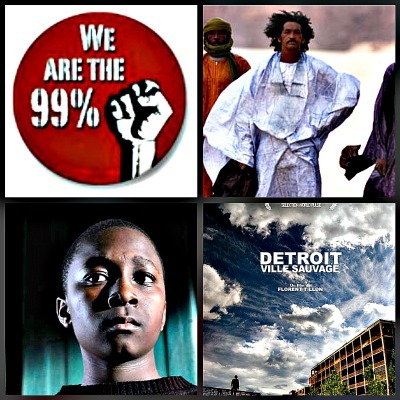 The historic Occupy moment for social and economic equality was called by scholar Cornel West a “democratic awakening,” while throughout history, every freedom movement has had its own soundtrack or anthem for the long march home. And yet, there was not one dominant or lead song to emerge from the throng, an echo perhaps of the mass chorus of a movement without one soloist. Back in the high days of student organizations, protest and topical songs—the ’60s civil rights, free speech, anti-war and black power movements—marchers relied on folk tradition (reviving the old songs with the intention of forging something new). Rewriting spirituals for the secular world—or at least a world in which all faiths and traditions get equal respect—was an area mined by Pete Seeger, who along with Joan Baez, helped to turn “We Shall Overcome,” into an unofficial anthem of the Civil Rights Movement (most memorably, Baez sang it at the 1963 historic March on Washington; Seeger sang it at OWS). Originally based on the gospel song, “I’ll Overcome Some Day,” composed by the Rev. Charles Albert Tinley and dating back to the African American Methodist Episcopal Church of the early 1900s, “We Shall Overcome” has changed shape through the years; also contributing to the version as we know it were elements of the spiritual “We’ll Overcome (I’ll Be All Right)”, another hymn from the immediate post-slavery period. But it wasn’t long after its arrival in church hymnals that “I’ll Overcome Some Day” was picked up by striking miners and laborers who went on to use it throughout their organizing fights in the ’20s, ’30s and ’40s. Sung by miners in the North as well as tobacco workers in the South, “We Shall Overcome” became a staple at the Highlander Folk School, the training ground for civil rights workers. Highlander teacher Guy Carawan helped to popularize the song among the forming Student Nonviolent Coordinating Committee (SNCC) in 1960 and the song was spread far and wide by Seeger who changed up the verses a bit. By and by, the melody to “We Shall Overcome” came closer to echoing another slave time spiritual, “No More Auction Block” (once sung by Paul Robeson and Odetta and used by Bob Dylan as the tune for “Blowin’ in the Wind”) than Tinley’s “I Shall Overcome” did. In essence, two folk standards emerged from one spiritual. But more than its fairly tame melody, the strength of “We Shall Overcome” lies in its extraordinarily bold lyrical affirmations: We are not afraid/the truth shall make us free/we shall live in peace. These sentiments are as ripe for the current moment, as they were when the United Farm Workers used it in their fight for their rights, as when South Africans sang it in their struggle against Apartheid, and when Czechs sang it during the Velvet Revolution that overthrew communism. “We Shall Overcome” has been deployed in struggles in India and Ireland. It’s been sung by Bruce Springsteen and was recorded for his Seeger Sessions; Seeger, now in his ’90s, is still singing it. Though I’d say it’s time for someone from the youngest generation of American singers, songwriters and activists to adopt and adapt it, and lead the singalong. “We Shall Overcome” needn’t be consigned to folk’s moldy or buttoned-up past; rather, it’s protest gold, a song that hasn’t lost its value for over 50 years and counting. If it seems strange, update it. If it seems square, give it a beat. But traditional songs need to get sung and sung loud, as if your life depended on them because in fact there are people whose do: Overseas wars cost not only money but lives; poverty is killing people here at home. Workplace and housing discrimination, poor schools, environmental degradation, job disintegration—these are just some of the grievances that will end up in songs as the movement keeps moving on. Dr. Martin Luther King Jr. knew what music could bring to a non-violent protest effort: he asked gospel great Mahalia Jackson to accompany him and Harry Belafonte to help organize his efforts. Belafonte’s life is a demonstration of just how important a role a singer can play in effecting change as well as how education in the arts can save young lives Nina Simone; Curtis Mayfield; Bob Marley; Peter, Paul and Mary; Sam Cooke; and many, many more singers and musicians contributed to positive social change and quite possibly political change with their music. You may laugh at this notion of change, but people from all walks of life, all genders, all religious backgrounds, colors and sexual orientation, here and elsewhere in the world, are standing up to the indignities served up to their communities. So here’s to you, activists and musicians: To Michael Franti, Pete Seeger, Tom Morello, Talib Kweli, Boots Riley, Ozomatli and Ben Harper: Every movement, from abolition to women’s suffrage to labor and civil rights has its songs, and this moment in time has its songs too. Thank you—to the singers and your songs—songs that one night might be the only thing between the darkness, cold, tear gas and rubber bullets raining on someone’s soul. Thank you for singing, so that we shall all overcome, someday. Origin of Song columnist Denise Sullivan is the author of Keep on Pushing: Black Power Music From Blues to Hip-Hop. 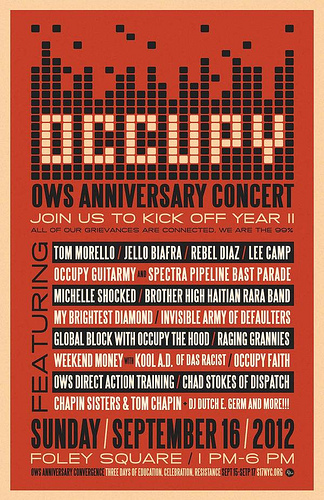 Tuesday May 15 saw the release of Occupy This Album, a 4-disc collection of 99 topical songs, with all proceeds going toward supporting the Occupy movement. I have not yet read a review of the album that makes any sense to me, which is reason for me to get busy listening and to write one of my own (though if you have read anything thoughtful and well-rendered, please bring it to my attention). Until I’ve prepared my piece, I thought I’d repost a column I wrote last fall titled Songs for the Occupation—a kind of call for topical songs and a roll call of musicians who declared themselves 99 percent friendly from the start. No doubt the good people at Paste won’t mind if I post the previously published article here, since it pertains to a good cause and all. NOVEMBER 2011—Early last month, when the Occupy Wall Street movement was still building, an East Bay punk rocker asked me what I thought people had hoped to achieve by occupying city centers and marching in the streets. Since the movement is without spokespeople, it wasn’t my place to say, but personally, I was taking it as a good sign that people are finally coming together in the name of social and economic justice. “I think it’s time to bring compassion back into style” I said. “Good luck with that,” he replied, and no, he wasn’t being sincere, which took me aback for about a minute until I remembered that punk rock is supposed to be snotty, cynical and nihilistic and he was just doing his part to keep the franchise alive. It must be said that plenty of punk-rock people are as interested in building things anew as they are in tearing down the old down, and that music people of all orientations have always brought soul, sounds and heart to social and political movements. So far, only the true lionhearts of contemporary music have turned out for the Occupation, though each week brings more surprises: Ever-ready artist/activist Michael Franti showed up in the first week of October to “Yell Fire.” Talib Kweli, longtime resident in the trenches of conscious hip hop, dropped by to drop some rhymes and weigh in with a powerful new piece he called “Distractions”: “Skip the religion and the politics and head straight for the compassion, everything else is a distraction,” he rapped. Tom Morello, who as The Nightwatchman, shows up with his ax wherever injustice is served, came out to lead a chorus of “This Land is Your Land,” the old Woody Guthrie song that’s easy enough to sing along to, even if you don’t know the words. And the generally apolitical Jeff Mangum of Neutral Milk Hotel delivered a rare, impromptu set of songs to the delight of park dwellers. In particular, the line “we know who are enemies are” from the fan favorite, “Oh Comely,” drew cheers from the crowd. Mangum’s appearance, if not his topically unspecific songs, provided the people with entertainment and support, the kind of unique companionship that only a song can provide in the cold, cold night. Sure the protesters have each other for company—for now—but as rousts and arrests increase, winter sets in and the drum circle decibels rise, the park may see fewer folks willing to stand strong, and that means fewer professional musicians out there, leading the singalongs. 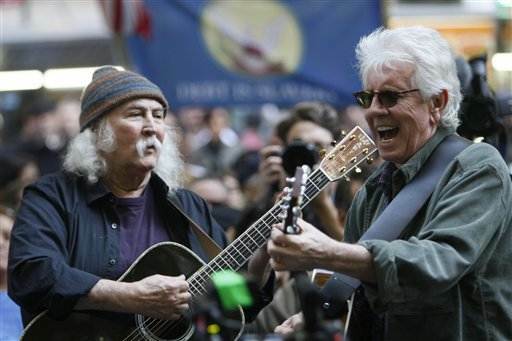 “Our idea was to go down and raise their spirits,” said David Crosby, who with Graham Nash sang for the Zuccotti Park crowd in early November. “What music is doing is unifying the people, bringing them together,” Nash told Rolling Stone. Hip hop organizer and mogul Russell Simmons is among those on the street with the 99 percent; part of his role there has been shepherding visitors like the Rev. 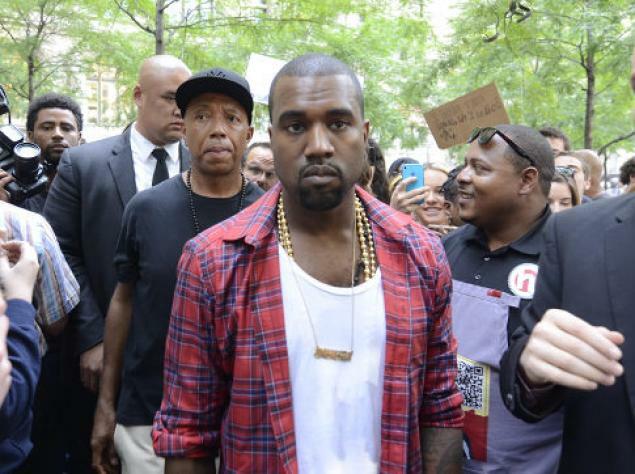 Al Sharpton and Kanye West through the Zuccotti Park encampment. During the week of West’s and Jay-Z’s Madison Square Garden concerts in November, Simmons was pictured with Jay-Z wearing an “Occupy All Streets” t-shirt, manufactured by his line, Rocawear (it’s unclear where the proceeds are going, though one can only hope the merch is made in America). The Occupy movement for social and economic equality has been called by scholar Cornel West a “democratic awakening,” while those less enamored with the movement call it a disorganized mess. Call it what you like but whether the occupiers maintain their ground at the park or are forced to leave it, songs—the kind with roots, that are built to last—will provide some sustenance through the winter. Truth is, the people can always use a few more good tunes (or at least some remixes of old ones) to sing on the long march home. Back in the salad days of protest—the ’60s civil rights, free speech, anti-war and black power movements—rewriting the old songs with the intention of forging something new was common practice—it’s called folk tradition. 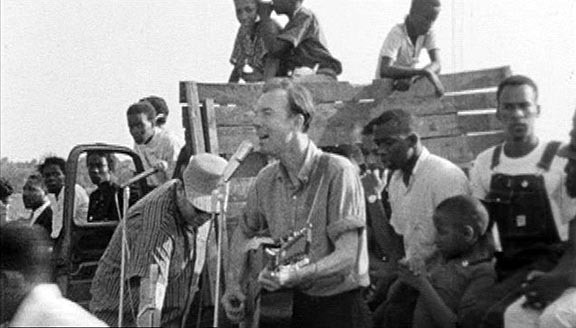 Rewriting and reviving spirituals for the secular world—or at least a world in which all faiths and traditions get equal respect—was an area mined by Pete Seeger, who along with Joan Baez, helped to turn “We Shall Overcome,” into an unofficial anthem of the Civil Rights Movement (most memorably, Baez sang it at the 1963 historic March on Washington; Seeger recently sang it at OWS). But more than its fairly tame melody, the strength of “We Shall Overcome” lies in its extraordinarily bold lyrical affirmations: We are not afraid/the truth shall make us free/we shall live in peace. These sentiments are as ripe for the current moment, as they were when the United Farm Workers used it in their fight for their rights, as when South Africans sang it in their struggle against Apartheid, and when Czechs sang it during the Velvet Revolution that overthrew communism. “We Shall Overcome” has been deployed in struggles in India and Ireland. It’s been sung by Bruce Springsteen and was recorded for his Seeger Sessions; Seeger, now 92, is still singing it. Though I’d say it’s time for someone from the youngest generation of American singer/songwriter/activists to adopt and adapt it, and lead the singalong. “We Shall Overcome” needn’t be consigned to folk’s moldy or buttoned-up past; rather, it’s protest gold, a song that hasn’t lost its value for over 50 years and counting. If it seems strange, update it. If it seems square, give it a beat (djembe will work just fine). But traditional songs need to get sung and sung loud, as if your life depended on them because in fact there are people whose do: Overseas wars cost not only money but lives; poverty is killing people here at home. Workplace and housing discrimination, poor schools, environmental degradation, job disintegration—these are just some of the grievances that will end up in songs as the movement keeps moving on. Dr. Martin Luther King Jr. knew what music could bring to a non-violent protest effort: he asked gospel great Mahalia Jackson to accompany him and Harry Belafonte to help organize his efforts. Belafonte’s life is a demonstration of just how important a role a singer can play in effecting change as well as how education in the arts can save young lives (Belafonte tells his own story in the new film, Sing Your Song, and new book, My Song: A Memoir). Nina Simone; Curtis Mayfield; Bob Marley; Peter, Paul and Mary; Sam Cooke; and many, many more singers and musicians contributed to positive social change and quite possibly political change with their music. You may laugh at this notion of change, like the East Bay punker I talked to last month did, but it’s not so funny when you think about Oakland: People from all walks of life, all genders, all religious backgrounds, colors and sexual orientations, there and elsewhere, are standing up to the indignities served up to their communities: It’s one nation time—under a groove. So here’s to you, Occupiers and musicians: To Michael Franti, Jeff Mangum, Pete Seeger, Tom Morello, Joan Baez, Crosby and Nash, Joseph Arthur and Talib Kweli in NYC, Boots Riley in Oakland and Ozomatli in L.A. The hearts of Joe Strummer, Nina Simone, Phil Ochs and Paul Robeson are on your sleeves now. Every movement, from abolition to women’s suffrage to labor and civil rights has its songs, and this moment in time has its songs too. Thank you—to the singers and your songs—songs that one night might be the only thing between the darkness, cold, tear gas and rubber bullets raining on someone’s soul. Thank you for occupying—so that we shall all overcome, someday.